Protecting beautiful heirlooms and French heritage is Anouk's passion, so much so that she runs an exclusive antique shop dedicated to placing precious treasures in the hands of the perfect people. She's horrified to discover that there's a thief on the loose in Paris, stealing such treasures, so she decides to catch them in their tracks. Surely it couldn't be the dashing American who has just arrived in her city, determined to make her see romance through the same rosy hue she sees her antiques? Anouk is a complicated heroine. She's a little hard to get to like to start with because she's so intense. She's very passionate about protecting French heritage and the antiques in her store - only selling to genuine customers who she knows will value the treasures. Some of her intensity can come off as a little abrasive, and I wasn't so sure of her at the start, but it's all because of her love of her antiques, and as she falls in love we get to see her icy corners melting. Tristan is a handsome American, new to town and the antique auction circuit. He's pretty suave, in a potentially suspicious way, but I found him really quite delish from the beginning. Anouk is a harder customer though! She's been hurt in the past and doesn't trust men - especially not American men. It doesn't help that she then starts to suspect him of being the antique thief! As they fall in love, Anouk must contend with dealing with her feelings about trusting a man at all, let alone trusting a man who she suspects of a crime against her beautiful antiques. So we get a sweet romance, mixed into a fun little Parisian mystery. One of the things I always like best about Rebecca Raisin's writing is her secondary characters and this story was no exception. I loved her flighty sister who moves in to make even more trouble for Anouk (but of course helps her alone the way too). And I really liked the secondary story following Anouk's mother and father and their own relationship dramas. The mother is just fabulous. Rebecca Raisin's novellas are definitely my favorites of her books (especially The Bookshop on the Corner), but the longer novels like this one are charming reads as well. 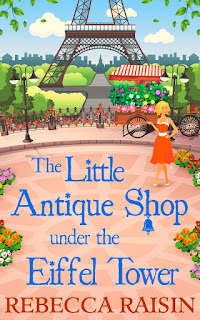 The Little Antique Shop Under The Eiffel Tower is a fun mystery romance with the charm of Raisin's small town novellas but in Paris! The Little Antique Shop Under The Eiffel Tower by Rebecca Raisin is a contemporary romance, released by Carina UK on June 30, 2016.